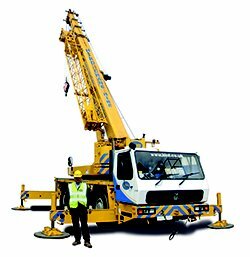 Vacuum lifters hired from Hird perform vital and exacting glass lifting tasks. Our clients also, quite rightly, expect them to give reliable service. 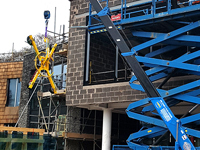 That is why, every time they are hired and brought back to our depots from a lifting project, they undergo our 8-point vacuum lifter testing proceedure. 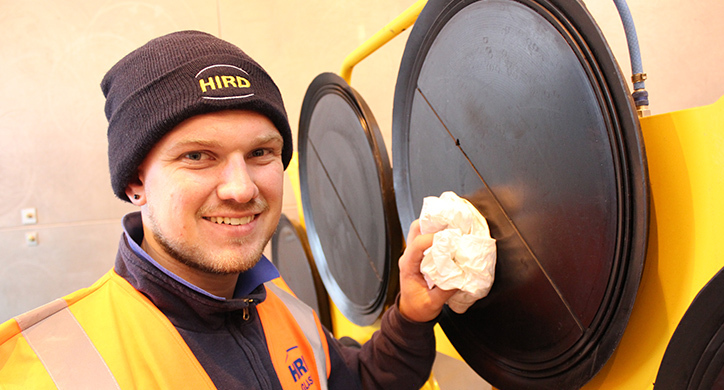 One of Hird’s trained personnel who supports this checking process is Quality Assurance Engineer James Eades. 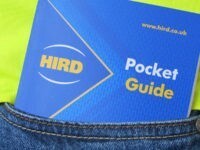 He said: “The service check is a mandatory part of our quality assurance systems. It is carried out every time the vacuum lifter goes out on hire or comes back to the depot, even if it’s just a day’s hire. 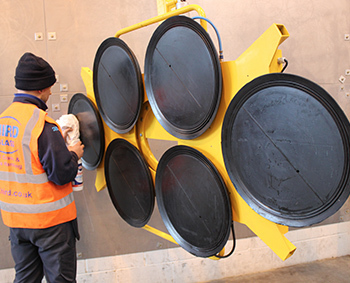 Vacuum pad cleaning: the vacuum lifter is attached to a Valla mini crane and its pads are cleaned thoroughly. Importantly this also gives James a chance to check close-up for any cracks or deformities that might affect vacuum power. 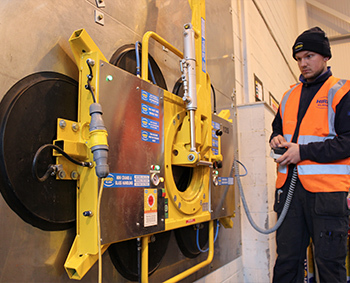 Visual check: the vacuum lifter is looked over carefully to check for any faults, cracks, breakages or missing parts. James is experienced with all our vacuum lifters so knows the tell-tale signs when something is wrong. Suction test: the vacuum lifter is then stuck to the test wall – or, more precisely, a jumbo steel sheet attached to the wall designed to mimic a glass panel. It’s then left for at least 10 minutes, and if the vacuum pressure drops by more than 5% in this period it will fail its test. James can also tell by sight and sound if something needs to be checked further. Clean connection valves: Many vacuum lifters have extension arms, which are connected to the suction pumps with quick-connecting valves. These are also checked & cleaned to ensure they maintain a tight seal when in use. Charging test: The vacuum lifter is plugged in to the electricity supply and checked to ensure it is charging efficiently as well as being PAT tested for electrical safety. Greasing: Vacuum lifters that tilt and rotate have mechanisms that need to be regularly greased so they continue to move smoothly. 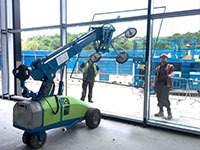 This ensures the vacuum lifter performs well on site, which is vital when positioning glass panels with precision. Manipulation test: The vacuum lifter’s tilt and rotation functions are tested, to ensure the machine is performing optimally and in accordance with the manufacturers recommendations. This is also performed under load. Check operator notices: The final task is to check that operator warning stickers, and health and safety notices are in place. This includes the LOLER disc, which certifies that the vacuum lifter has passed its six monthly thorough examination under LOLER. During this 8-point performance and safety testing process, James is ready to respond to any issues he finds, replacing faulty parts, or carrying out further tests, if they are needed. 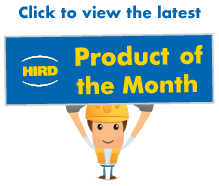 It is an important and vital element of Hird’s customer service promise: to provide the right vacuum lifters for the glass lifting projects they are being hired for, and to ensure they are ready, and safe, to do the job at hand. 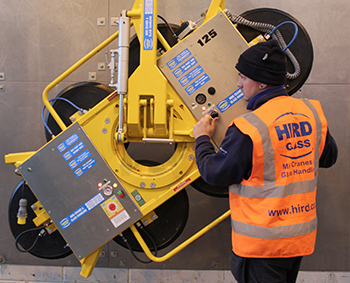 For more information about Hird’s glass lifter hire service, available nationally via our three regional operating centres, contact us today.